Back in the late 1800s, a new craze was sweeping homeowners across the nation: electricity. Electricity was made available in homes through a method called “knob and tube” wiring. For the era, this was great stuff. Nowadays it’s just plain old, and has a potential to be very real fire hazard – it should always be replaced whenever possible. 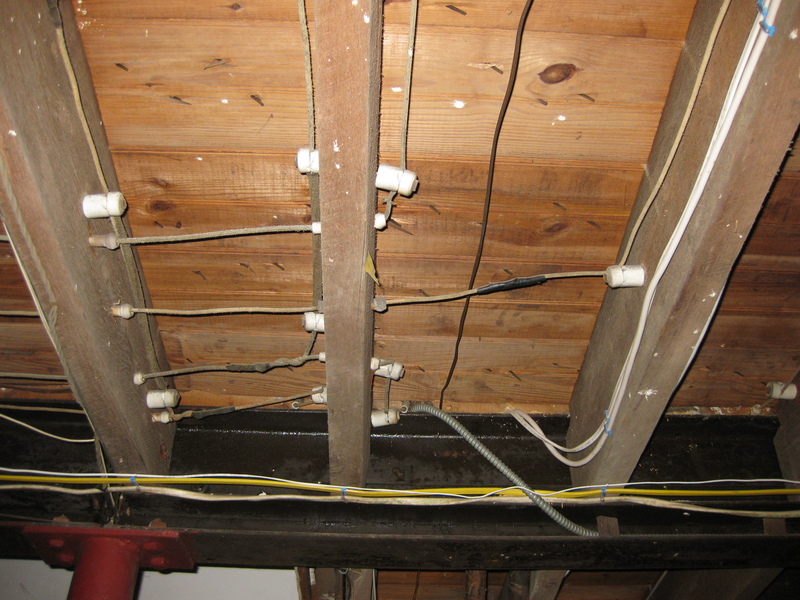 Most insurance companies will not insure your home if it contains knob and tube wiring (or a fuse panel for that matter). What is this stuff anyway? Knob and Tube wiring, sometimes abbreviated K&T, was a standard wiring method that was implemented as far back as the 1880s, and was used up until the 1940s and 50s. It is called Knob and Tube, because the single-conductor wires are supported by cylindrical ceramic nailed-down knobs, and passed through studs or joists via ceramic tubes which helped to insulate the wires. Splices were usually made by soldering the wires together and then just wrapped up with cloth tape. These were left in “open air” without the splice being contained in an electrical box (a requirement today). Where conductors would enter a switch or outlet box, the wire would be protected with a cotton cloth covering saturated with asphalt, called “loom”. As I mentioned above, many insurance companies will not insure a house that contains this type of wiring method (or even a fuse panel). The National Electrical Code prohibits the use of insulation of any sort installed in walls or ceilings where Knob and Tube wiring exists. This is because of a potential fire hazard. If any sort of insulation comes into contact with the conductors, they can’t disperse heat properly as they were originally designed to. The cloth-like or rubber insulation breaks down after time. This may cause the conductor to be bare and unprotected – a real shocker! 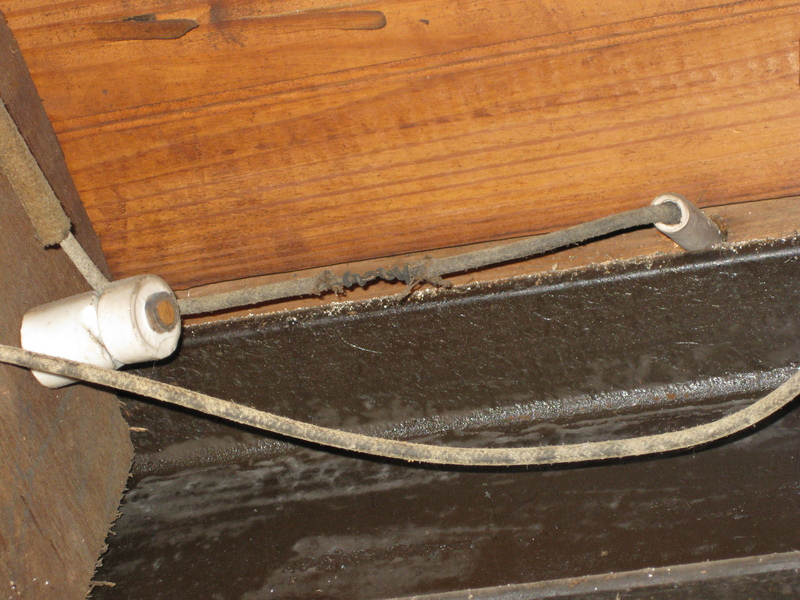 This old style of wiring was mainly used to power things such as electric lamps, not modern equipment such as air conditioners, refrigerators, computers, space heaters, etc. A lot of times the “neutral” wire was switched instead of the “hot” wire. This dangerous practice is against modern electrical code, but was a common practice in the era of K&T. There is no equipment grounding conductor with this type of wiring system. Grounding is arguably the most important part of a sound electrical system. A tell-tale sign that an electrical outlet might be fed with Knob & Tube is that the receptacle is only a “2-prong” version, missing the 3rd prong on the bottom which is for the grounding conductor. A bad situation: I have heard of a report of someone hanging a metal clothes hanger on an exposed piece of knob and tube wiring located in the ceiling in the basement. Then, when they went to grab the metal hanger while doing some laundry in their bare feet, they literally got quite a shock. Fortunately, the person was OK and just shaken up a bit. In the right set of circumstances, this could be a deadly situation. What can be done? We are always glad to come out and consult with you about your options. Your expert team at McCurdy Electric can quickly diagnose, and if necessary, upgrade the antiquated wiring system to current safe code standards. The wiring method that we install will more than likely be installed for the next 100 years or more, just like the Knob & Tube has been. We have many years of experience working in the older New England homes that are still utilizing the old wiring methods, therefore, we already know what to look for. The cost of our diagnostic evaluation is $250. This includes a 2 hour session with two of our team members. The licensed electrician will look at any switch outlet boxes, receptacle outlet boxes, lighting outlet boxes, and any accessible K&T wiring to determine how much needs to be replaced. We will refund half of the $250 evaluation fee when you sign the proposal to perform the work needed. Please feel free to contact us with any questions or concerns that you might have. Many older Boston homes have been unable to insulate fully because of barriers such as knob-and-tube wiring or asbestos. The Department of Energy Resources (DOER) recently announced a new first-come-first-serve round of funding to help insulate these homes for energy efficiency improvements.